I bet you’ve all been eagerly awaiting the next thrilling installment of Ear Piercing 101. Well, you lucky people- here it is! An industrial piercing is traditionally a pair of helix piercings connected by one barbell- like the one pictured. 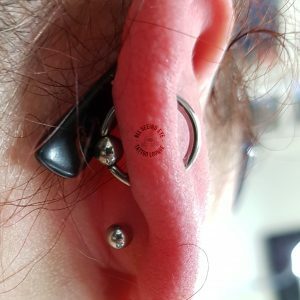 Maybe you want to connect your upper conch to your lower conch, or your rook to your daith… why stop there? 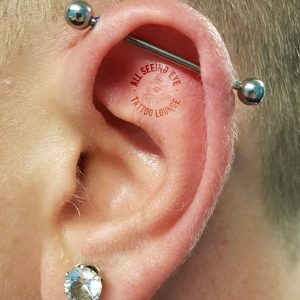 Thanks to the wonderful people at Industrial Strength, an industrial can be several ear piercings interconnected via specialist jewellery. 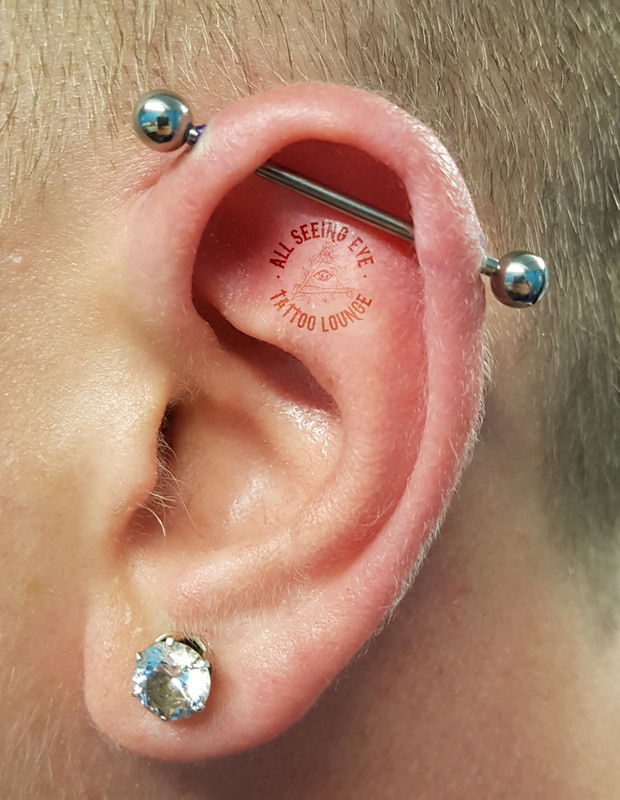 unfortunately not everyone is suited to the traditional-style industrial so a consultation with your piercer is always recommended. Also, industrials are uncomfortable to have pierced, and can be a pain in the… ear to heal. The one true orbital is two piercings connected by a ring; they are the circular equivalent of the industrial. 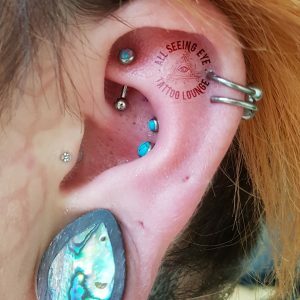 They’re typically placed in the helix or lobe, but you can get a little more adventurous and get the rook-to-forward helix ‘UFO’ orbital (if you really hate sleeping that is). Like the industrial, they can be difficult to heal; but there’s no denying how badass you will look wearing one! Rook piercing is placed through the inferior crus of the triangular fossa, which is the sturdy fold just behind the forward helix. They look great with either a ring or a curved barbell with a bit of added sparkle. Like most cartilage piercing, they can be quite uncomfortable to have done but they usually heal without too much fuss. The photo to the left is of Coral’s ear. 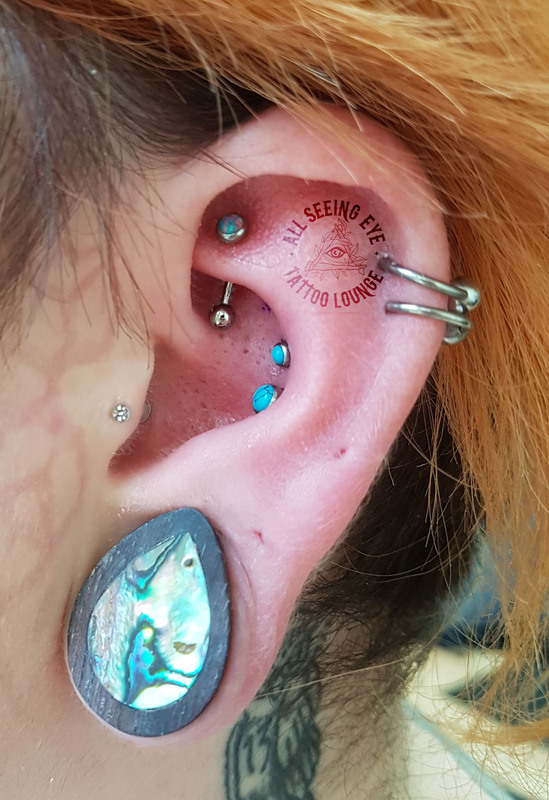 As well as a fancy rook piercing it also features a pair of fancy turquoise conch piercings, two helix rings, a little diddy tragus, a stretched earlobe, AND some facial scarification (Coral is a bonafide baddass! ).